MainAll NewsMiddle EastJordanian King to "Fight Judaization of Jerusalem"
Jordanian King to "Fight Judaization of Jerusalem"
Temple Institute head laments: "The gov't is not asserting the authority and sovereignty of the Jewish people in our homeland." Jordanian King Abdullah II added fuel to the ongoing debate over Jerusalem and the Temple Mount Sunday, when he told visiting Muslim and Christian dignitaries from Jerusalem that he will continue his efforts to “safeguard” Islamic and Christian sites in the holy city of Jerusalem from what he termed "Judaization." The Hashemite monarch also expressed his willingness to “support the steadfastness of Muslim and Christian Jerusalemites and to preserve their legitimate rights in the city,” according to a statement from the Royal Court, published Sunday in The Jordan Times. 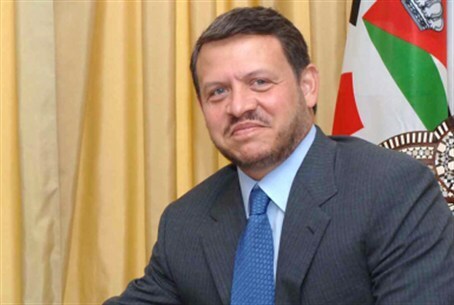 According to the statement, Abdullah said that Jordan “will not spare any efforts, whether political, diplomatic or legal to protect the city, highlighting the Kingdom’s historic role in securing the holy sites." The Jordanian king also emphasized his country's cooperation with the Palestinian Authority, in working to assert "Jordan’s role as custodian of the holy sites of Jerusalem and Palestinian sovereignty over all of Palestine, including East Jerusalem." Husseini said the agreement had boosted Jordanian-PA coordination at local and international levels. Sheikh Abdul Atheem Salhab, head of the Islamic Awqaf Council in Jerusalem, called Jerusalem and the Al Aqsa Mosque a “red line” for the Jordanian monarch. He added that “attacks” against Al Aqsa had increased recently, “especially by settlers storming Al Aqsa under the protection of the Israeli forces” - a reference to ascents by Jewish pilgrims to the Temple Mount, which is the holiest site in Judaism. He also cited “attempts by right-wing ministers in the Israeli government to legitimize Jewish prayers inside Al Aqsa,” and warned of an unspecified “era-bound and location-based” division plan of the mosque, to “eventually rebuild what they allege to be the Solomon’s Temple,” according to the Jordanian royal statement. "We are not acting like a sovereign state"
The Jordanian government is responsible for the Waqf - an Islamic trust which oversees religious sites, including the Temple Mount in Jerusalem, which is Judaism's holiest place and also the site of a large Islamic complex. The Waqf has been accused of actively working to prevent Jews from praying at the Temple Mount through political pressure and threats of violence. Despite the Temple Mount being the holiest site in Judaism, consecutive Israeli governments have caved into pressure by the Waqf and Islamist groups, and banned Jewish prayer - and restricted visits by religious Jews - at the site. Religious Jews who do ascend are "screened" to ensure they are not carrying any holy items which may be deemed "offensive" to Muslim worshippers. The Waqf has also been accused by archaeological experts and Jewish groups of working with Palestinian Authority to "Islamize" Jerusalem - publicly denying the Jewish connection to the holy city and actively working to destroy ancient Jewish antiquities. Sheikh Salhab's comments about the "alleged" existence of the Jewish Temples is common practice among PA-affiliated religious and political figures. The aforementioned "accord" between the Jordanian government and the PA appears to be an attempt to reaffirm that partnership. Rabbi Chaim Richman, Director of the Temple Institute, which campaigns for greater Jewish rights on the Temple Mount, expressed his frustration at "the absurd idea that the government of Israel recognizes the so-called 'historical role' of Jordan in Jerusalem. Jordan has absolutely no claim to Jerusalem whatsoever." "The fact that we cow-tow and grovel before a foreign element like Abdullah and ascribe some kind of role to him on Judaism's holiest site, is an illustration of the low level we are on nationally." Rabbi Richman linked the Israeli government's "weakness" on the issue of sovereignty on the Temple Mount to its capitulation to American pressure in agreeing to release more than 100 terrorists convicted of murdering Israeli civilians. "We have no self-respect," he lamented, "And thus we do not conduct ourselves like any other sovereign state... Today, Bibi agreed to release 104 murderers with the blood of our children on their hands - when would America agree to release such people under foreign pressure? "Similarly, when it comes to this issue [the Temple Mount], which is the heart and soul of the People of Israel, the government's position is one of self-immolation, self-castration." He added, "People feel very vulnerable - they feel like the government is not asserting the authority and sovereignty of the Jewish people in our homeland." "Despite the fact that we do not have leadership, the people are waking up and leading the way... The Temple Mount is a part of the Israeli national discourse, after being neglected for so long. That's why Abdullah and his friends felt the need to so urgently reaffirm their 'commitment to Jerusalem.' Their comments only strengthen our resolve."